This Battle of the Planets - Original Television Soundtrack double disc collection was issued in 2004 by Silva Screen Music. 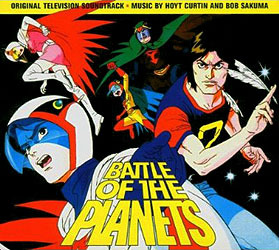 This two disc soundtrack featured a wealth of Hoyt Curtin's original Battle of the Planets music in addition to Bob Sakuma's Gatchaman score. It was also issued in the US by Silva America.